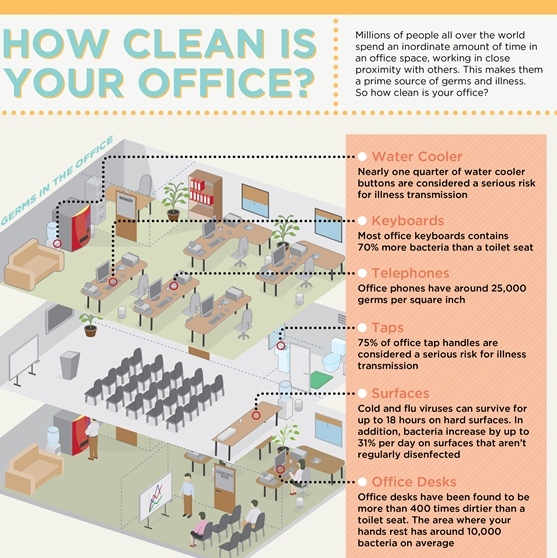 HomeContract CleaningIs Your Office a Breeding Ground for Germs? As the old saying goes, cleanliness is next to godliness. No, this isn’t a religious rant about the importance of keeping your offices clean, just a reminder that it is the responsibility of business owners to ensure take a proactive approach to maintaining high standards of cleanliness in offices and business premises. You might think your office is superficially clean, but perhaps it’s best to exercise a bit of caution. Think about it – most offices have a lot of employees packed into one building, not to mention visitors and clients, and if anyone’s suffering from a cold or other illness it could quickly spread. Offices, factories, schools, hotels and other business premises are breeding grounds for germs and bacteria. There’s lots of research to back this up. In a detailed study conducted by Chuck Gerba PhD (a professor of environmental microbiology at the University of Arizona in Tucson) he found that the average desktop has 400 times more bacteria than a toilet bowl, simply because people usually don’t clean their desks on a regular basis. Most of these germs are harmless, but Gerba and his colleagues also found high levels of the parainfluenza virus, which causes colds and flu, on about one-third of office surfaces. The germiest object: the phone. Viruses such as the flu can survive for two or three days on desktops, phones, and computer keyboards. They’re transmitted when you touch contaminated objects and then put your hands on your nose, mouth, and eyes, says Gerba. (By the way, the door handle on the microwave in the office kitchen is also a very germy place. So be sure to wash your hands after heating up your lunch.) Keep microbe levels on your desk down by regularly cleaning with a disinfecting wipe, particularly during flu season. Don’t apply disinfectant directly to equipment, which can damage it. Spray first on a paper towel. If you share a phone, clean it every day. Wash your hands often (with warm water and soap or an alcohol-based hand handwash), and don’t touch your face, says Gerba. Maintaining high levels of cleanliness in your office is clearly important for a number of reasons. It helps bring about a semblance of order, keeps work stations and communal rooms free of dust and clutter and gives a positive impression to both workers and visitors. 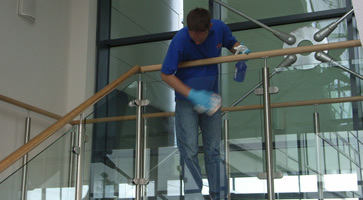 But ensuring business premises are cleaned effectively makes commercial sense too. 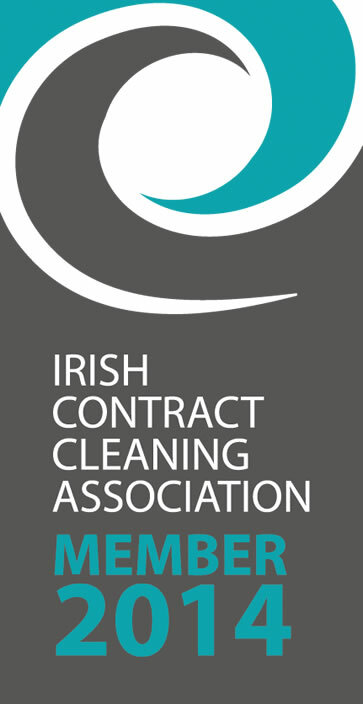 If a member of staff becomes ill from unsanitary working conditions, it could have a clear impact on productivity. It may require the business to hire a temporary agency worker which could have an impact on profit margins. Implement a clean desk policy. If empty sandwich cartons, crisp packets or drinks cans are lying around on desks, dirt and germs could quickly follow. Don’t encourage your workers to be “martyrs”. If staff members are at work when they’re clearly ill it could spread throughout the office. Try and contain the problem by sending sick people home. Encourage employees to periodically wipe down their desks, keyboards and phones. Improve air quality. The air inside an office will be stale and can provide a fertile breeding ground for microbes, so throw open a window or invest in a dehumidifier to make things more bacteria-resistant.